Boil, boil, toil and trouble the Witches Brew Skinnies are here and ready for you! Get your Halloween on and start sewing. Each quilt finishes 14" x 28". 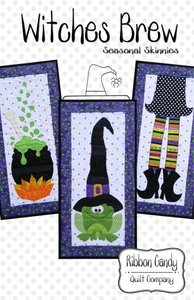 Fusible web applique is used to make each of these fun images. These fast and easy wall hangings are great for all levels of quilters. Be warned! These are very addicting! You won't stop at just one....you'll want to make them for all your quilty friends.